A fascinating journey through the Top End of Australia to explore what history means to the traditional landowners. A Frontier Conversation documents a unique collaboration between indigenous and white historians from Australia and North America. 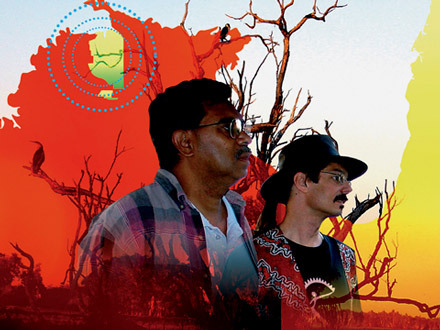 In September 2004, a diverse group travelled through the Top End of Australia meeting representatives of the traditional landowners, and engaging in a dialogue about indigenous history. The themes that emerged raised more questions than answers - from cultural appropriation and copyright, to land rights, the role of language and art, and what history means to indigenous communities in the current climate of cultural reclamation and survival. Narrated by Professor Ann McGrath, Director of the Australian Centre for Indigenous History at the Australian National University, A Frontier Conversation is a fascinating and thought-provoking account of a journey that breaks away from "the History Wars" and signals the first step in a new approach to the study of frontier history. "A Frontier Conversation asks intriguing questions, and has some unexpected answers. At one level, it's a very simple and watchable film about a group of historians from Australia and the United States visiting Indigenous people in the Northern Territory, and talking with them about the importance of history. As the film progresses, we realise that its concerns are not simple at all. They are nothing less than the complex problem of the very different uses that history is put to in different cultural settings, and its varied meanings and consequences as a result. The film asks some difficult questions: such as how valuable can histories written by outsiders to any community be? What are the responsibilities of the historian, Indigenous or not, to the people whose stories he or she attempts to tell?" Produced by Wonderland Productions for the Australian Centre for Indigenous History, Australian National University with support from the National Museum of Australia.